통일신라 신문왕이 돌아가신 후 그 아들인 효소왕이 아버지의 명복을 빌고자 세운 탑으로, 2단의 기단(基壇) 위에 3층의 탑신(塔身)을 세운 모습이며, 경주 감은사지 동·서 삼층석탑(국보 제112호)이나 경주 고선사지 삼층석탑(국보 제38호)에 비해 작은 규모이다. 기단의 양식은 두 탑과 거의 비슷하나, 기단의 각 면에 새겨진 가운데 기둥이 3개에서 2개로 줄어 있다. 탑신부도 여러개의 돌로 짜맞추는 대신 몸돌과 지붕돌이 각각 하나의 돌로 이루어져 있어, 달라진 석탑의 양식을 보여준다. 지붕돌은 윗면이 평평하고 네 귀퉁이가 살짝 올라가 경쾌하며, 밑면에는 5단의 받침을 두었다. 탑의 꼭대기에는 머리장식의 받침돌인 노반(露盤)만이 남아있다. 효소왕 1년(692)에 세워진 탑으로, 이후 효소왕의 뒤를 이은 성덕왕이 즉위한 지 5년만인 706년에 사리와 불상 등을 다시 탑안에 넣어 앞의 두 왕의 명복을 빌고, 왕실의 번영과 태평성대를 기원하였다. 1942년 착수된 탑 해체수리 과정에서 2층 지붕돌 안에서 금동 사리함과 금동 불상 2구를 비롯하여 많은 유물을 발견하였는데, 그중 사리함 뚜껑 안쪽에 탑을 건립하게 된 경위와 발견된 유물의 성격이 기록되어 있어 탑의 건립 연대와 조성 의도를 정확히 알 수 있게 되었다. 통일신라시대의 전형적인 모습이면서도 전기 석탑양식의 변화과정이 잘 담겨져 있어 소중한 자료적 가치를 지니고 있다. 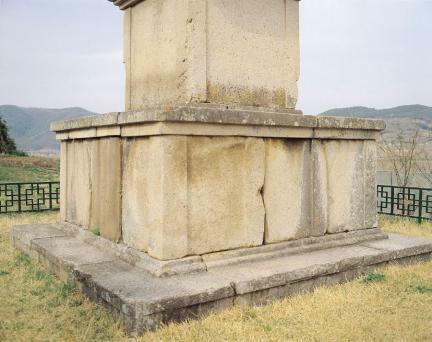 After the death of King Sinmun of Unified Silla, his son King Hyoso built this pagoda in 692 to pray for the repose of his deceased father’s soul. 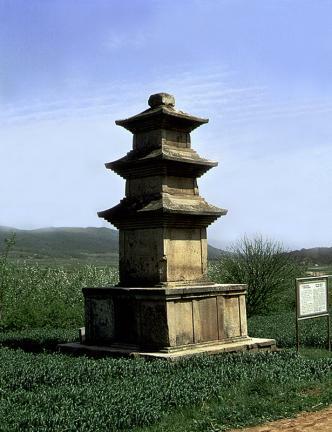 After the death of King Hyoso, his successor King Seongdeok placed sarira and Buddhist statues for the two previous kings in the pagoda, and prayed for the prosperity and peace of his kingdom. 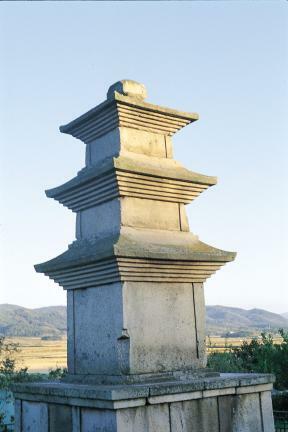 It is a typical stone pagoda of the Silla Period, consisting of a three-story body erected on a two-story platform. It is smaller than the East and West Three-story Stone Pagodas at Gameunsa Temple Site (National Treasure No. 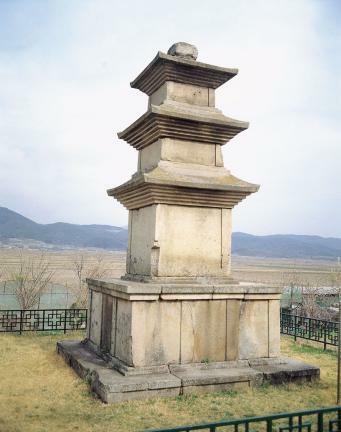 112) and the Three-story Stone Pagoda from Goseonsa Temple Site (National Treasure No. 38). The style of the platform is similar to that of the two aforementioned pagodas, but it shows signs of a change in the style of stone pagodas which saw the number of inner pillars of the first-story platform reduced from 3 to 2, while the main body and roof stones were each made of a single stone, rather than of several stones. The four corners of the roof stone are slightly raised to create a light appearance, and the roof supports consist of five layers. Only the base of the finial ornamentation remains on the top of the pagoda. With the dismantling and reconstruction of this pagoda in 1943, numerous Artifact were discovered in the second story roof stone, including gilt-bronze reliquaries and two gilt-bronze Buddhist statues. Some Chinese characters were carved on the inside of the lids of the reliquaries, providing information on the construction date and purpose of the pagoda. 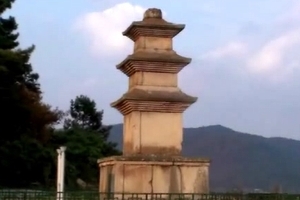 This pagoda exhibits the characteristic form of stone pagodas of the Unified Silla Period, and the changes in style that occurred in the early years of the kingdom.